Welded estate railings manufactured by Alpha Rail, have provided the finishing touches to a £1m World War One Memorial Park restoration project in Lincolnshire. Dating back to back to the 17th Century, Wyndham Park lies on the banks of the River Witham just to the north of Grantham Town Centre. Named in honour of Lieutenant William Reginald Wyndham who died in Ypres during the First World War, the park offers a wide range of facilities for both the young and old, and proudly holds the Green Flag Award. The £1m-park restoration was largely funded by £818,000 of Heritage Lottery and Big Lottery Funding, with South Kesteven District Council and the Wyndham Park Forum providing the remainder. The restored Memorial Park aims to invoke an era when men of the Machine Gun Corps marched through the historic Memorial Arch on their way to training at Belton Park. Woodhead Construction was appointed as the main contractor on the project and the funding provided has enabled the build of a new visitors centre with toilets. 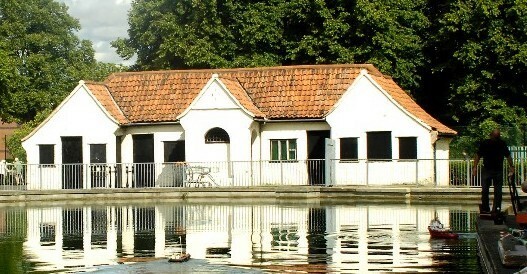 The funding will also cover the cost of restoring the Grade II listed ticket office, Memorial Arch and Model Boat Lake. As part of the project, Alpha Rail was contracted by Woodhead Construction to install 174 linear metres of welded unit estate railings to the perimeter of the memorial park. A number of single leaf gates were also incorporated as part of the railings system to provide park users with easy access in and out of the much loved park. Alpha Rail was also tasked with installing six pedestrian guardrails panels to the perimeter of the model boating lake, to provide a safe barrier and prevent park users from falling into the water. A bespoke single leaf palisade gate was installed and set into the existing palisade fencing on site. The single leaf gate was supplied polyester powder coated RAL 6005 Moss Green. All metalwork installed was supplied galvanised to help protect against rust during times of inclement weather. To view more examples of how welded estate railings have been used in other country parks and estates, please visit our project library for more information.